The rain has returned to Oregon, so for lunch today I craved something hearty. But I had a problem…I only had one hamburger bun. 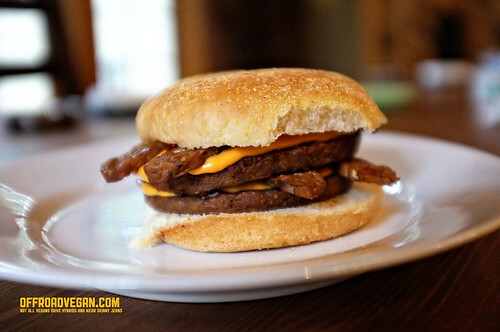 Soon, a smile crept in and I decided it would be National Vegan Junk Food Day in my house, and at that very moment. WARNING: This is not a fancy recipe. It’s a bachelor version. Heat, serve, stuff. 1. 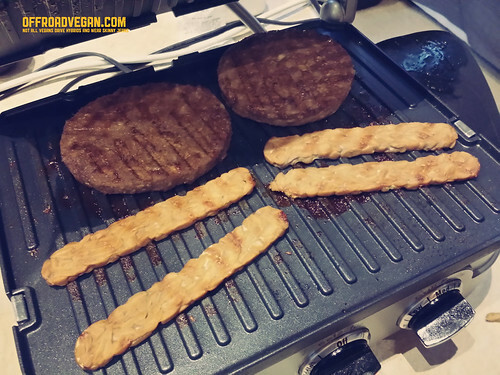 Grill your burgers on the grill and add bacon slices about half way through. Not the most appealing image, but at least it’s VEGAN. 2. 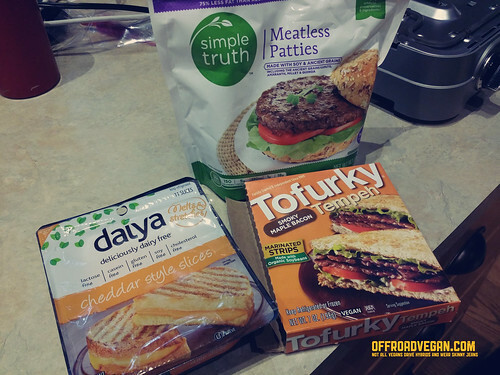 Add the Daiya when the burgers are just about ready. I used an electric grill, so I had to hold the lid down close to the cheese so the heat would melt it, but not too close that it stuck. 3. Once the cheese is melted, build your burger!